State borders are critical junctions where oppositional dynamics of exclusion and inclusion are played out. In the last eight years, transnational congruence inherent in economic globalization has clashed directly with the assertion of territorial security by the United States. Borders, harkening to the geopolitics of past centuries, are once again asserted to be sites of vulnerability and lines for maintaining control over people and territory. Border enforcement emphasizes controlling movement of undesirable people and goods, but it is also about ensuring domestic stability and countering challenges to the status quo. Given a history in which immigrants are as likely seen to be threats to national security as welcomed sources of assets and skills, border concerns and border control processes invariably breed anxiety about internal social and cultural boundaries as well. By differentiating the "other," borders and their supporting narratives reinforce them. In addition to immigrants and refugees, people considered sufficiently different from prevailing norms are also affected. While national border policies affect the nation as a whole, border regions are disproportionately impacted. Border regions are the locus of cross border social and economic relations, the first point of contact and interaction between nations. As such, they serve to mediate perceptions of, as well as actual, relationship between countries. Their functions as social and economic conduits are constrained as border controls are intensified. Borders, under these conditions, serve to weaken relationships, and impede cross­border cooperation in such areas as commerce, environment, and public health. But the costs of border restrictions are far more than material and environmental alone. They involve social and psychological costs of growing suspicions, reluctance to engage, or slowed momentum for investing further in well established transboundary networks for working in common to solve complex problems. 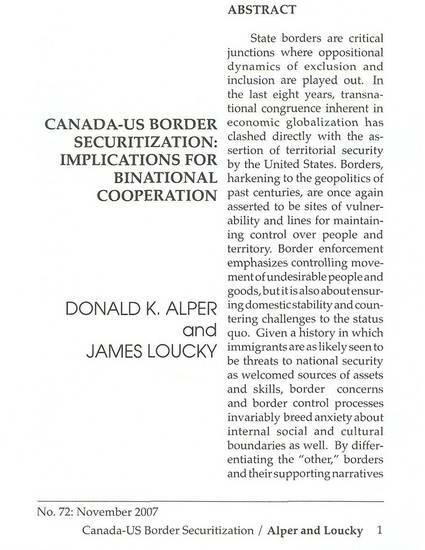 Focusing particularly on the Canada-U.S. border, this paper examines the impact of tighter border policies and enforcement processes on cross-border interaction, as well as their implications for binational and multinational security challenges. Among the questions that will guide the discussion are: What impact do exclusionary border policies have on host societies? How do border policies impact conceptions of border lands and binational cooperation? What problems are inherent in the often heralded trend toward smarter borders? Borderlands--Social aspects--United States; Borderlands--Social aspects--Canada; Border security--United States; Border security--Canada; Emigration and immigration law; Illegal aliens--Legal status, laws, etc.